The Darwin D. Martin Complex in the Parkside neighborhood of Buffalo, N.Y., contains six structures designed and built by Frank Lloyd Wright between 1902 and 1909. Many visitors come away from this historic site with a curious reaction: rather than envying the magnificent main Martin residence that dominates the grounds, they report a more vivid memories of the smaller structures on the property—the eight-room Barton house, designed for Darwin Martin’s sister and brother-in-law, and the 1,700-square-foot Gardener’s Cottage—than they do of the splendid main house, with its 17 rooms and adjoining enclosed pergola and conservatory. “I can imagine myself living in the Barton house or the Gardener’s Cottage” is a common observation. The George Barton house, built for Darwin Martin’s sister, Delta, and her husband, is actually the oldest structure in the complex, going up in 1903 – 4, before work on the main house began. Darwin Martin, the very successful secretary of the Larkin soap and mail-order company, may have commissioned the smaller house first in order to test how his working relationship with the famous architect would develop. Enduring features of the relationship did indeed emerge in this first project. The two of them selected the basic plan for the Barton house from the corpus of Wright’s existing work, modeling it on the T-shaped 1903 J.J. Walser, Jr., house, in the Austin neighborhood of Chicago. (The main house would also later replicate the cruciform plan, on a much grander scale.) Already on this first project there were massive cost overruns, a characteristic feature of Wright’s work for the Buffalo businessman. Martin originally hoped to build the Barton house for $4,000; the final cost was $12,000. Even the wood-frame-and-stucco Walser house had cost $8,000 to build, a fact of which Martin was apparently unaware until well into the building process. In contrast to the Walser house, the Barton house is clad in the more expensive long, thin Roman brick that would later be used on the main house. It also came with a full complement of Wright’s “light screens,” patterned windows with a unique design, and furniture expressly created for the house. The pattern also emerged of Martin’s criticizing aspects of Wright’s plans as he developed them but ultimately accepting the architect’s judgment. For example, Wright chose to locate the house as close as possible to an adjacent lot on the north, so as to maximize the space facing what would become the main residence on the south. Martin worried, rightly, that it would encroach on his neighbors. But although this arrangement left the kitchen uncomfortably close to the neighboring house, it permitted Wright to create an expansive south-facing porch, which served as an additional living space. The Bartons remained in the house where they raised an adopted daughter, Laura, until George’s death in 1928. Delta Barton moved into Laura’s home in Bryn Mawr, Pa., following George’s death. The house was continually occupied for all but two years until until 1966, when it was purchased by Eric and Eleanor Larabee, who undertook an extensive restoration. Eric Larabee, a noted writer and magazine editor, moved to the city to become Provost of the University of Buffalo. Eleanor, an architect, was one of the first women to study at Harvard’s Graduate School of Design after World War II and a graduate of Columbia University’s School of Architecture, Preservation and Planning. Although Eric Larabee resigned his university position in 1971, the Larabees maintained their residence in the Barton House until the 1990s, when it once again became part of the Martin complex. Martin and Wright first discussed the diminutive Gardener’s Cottage, the last structure built on the grounds of the complex, in 1905. Martin was passionate about his gardens, and the complex contained not only a conservatory but also greenhouses and extensive open-air flower beds. Martin charged his gardeners with providing a continuous supply of fresh flowers to all the rooms of the main house during his lifetime. Wright seems to have recognized early on that the commission for the Gardener’s Cottage offered him an opportunity to work out a typology for very small houses using the new architectural principles he was developing. Elements of the cottage would find their way into his design for “A Fireproof House for $5000,” published in the Ladies Home Journal in April 1907. Several more early Wright commissions, including the 1906 P.D. Hoyt house in Geneva, Ill.; the 1907 Stephen M.B. Hunt house in Lagrange, Ill.; the 1908 G.C. Stockman house in Mason City, Iowa; and the 1908 Raymond W. Evans house in Chicago represent variations on it, and elements of the design recur in still later Wright projects. For the cottage, Wright had to design a compact structure on a tiny plot of land only 37 feet wide. He opted for a rectangle, about 22 by 36 feet; the basic plan was the American foursquare, although Wright worked bedrooms into only three of the four upstairs corners, putting the bathroom and a large hallway in the northeast quadrant. 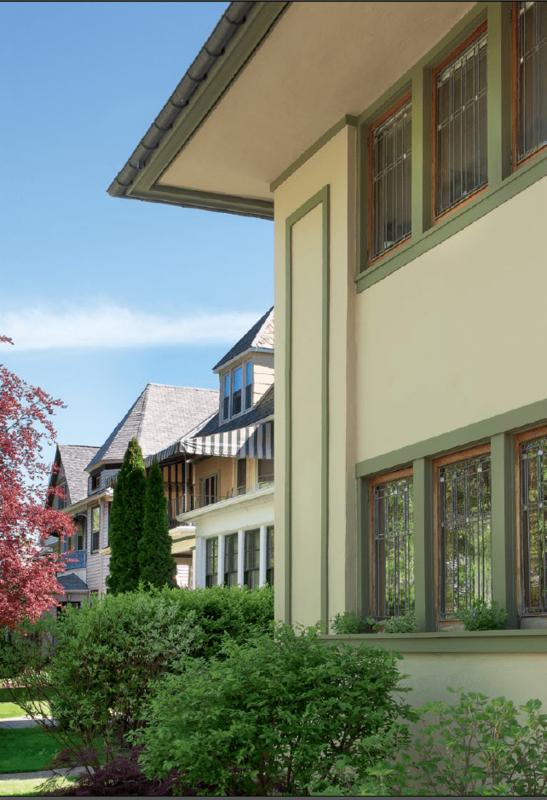 Wright relieved the boxiness of the plan by putting continuous bands of casement windows along the south, west and north elevations on both the ground and second floors. A first-floor flowerbox on the front elevation brings nature closer to the house. Despite its small size, Wright managed to work one of his signature semi-hidden entryways into the house, on the southern elevation. Entry into the living space involves turns and passage through a tiny (3-by-3-foot) vestibule. The ceilings of the porch and vestibule are lower than that of the living room, reproducing on a modest scale the variations in ceiling height that Wright used to distinguish spaces in his grander buildings. Wright’s final touch was to emphasis the load-bearing function of the four corners of the house by working two-story rectangles into the stuccowork. 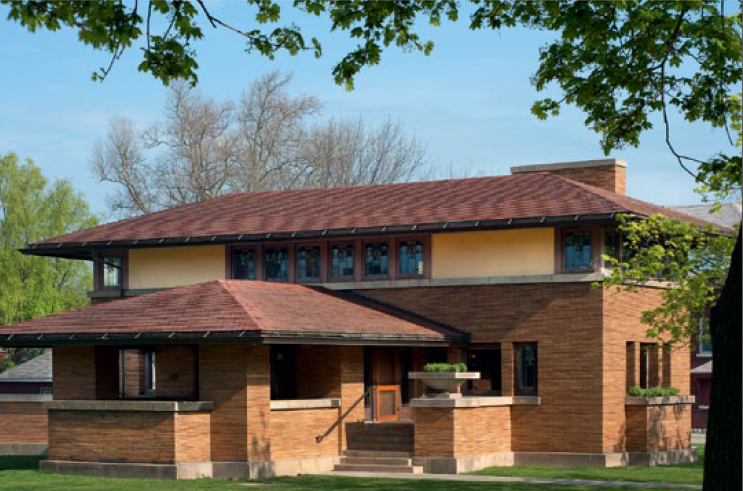 Since the small size of the cottage precluded the strong horizontal lines characteristic of larger Prairie houses, Wright opted here for stressing the vertical lines. Even Martin’s gardener got a full complement of light screens, with a simple geometric pattern. At least two of Martin’s gardeners lived in the cottage over the years. Thomas Skinner and his family moved into the house when it was completed and lived there until 1913. Apparently Skinner left the house because it was too small for his family; he continued working as Martin’s principal gardener until his death in 1916. A later Martin gardener, Rueben Polder, lived in the cottage with his wife, Cecelia, until Martin’s death in 1935. The Gardener’s Cottage appears to have had a unique provenance in that Wright must have had in mind the diminutive cottage at 113 Summit Ave., designed in 1900 by E.B. Green (1855 – 1950), another prominent Buffalo architect, as a counterpoint to his own structure. Like the Gardener’s Cottage, Green’s cottage is a foursquare, scarcely larger in square footage. 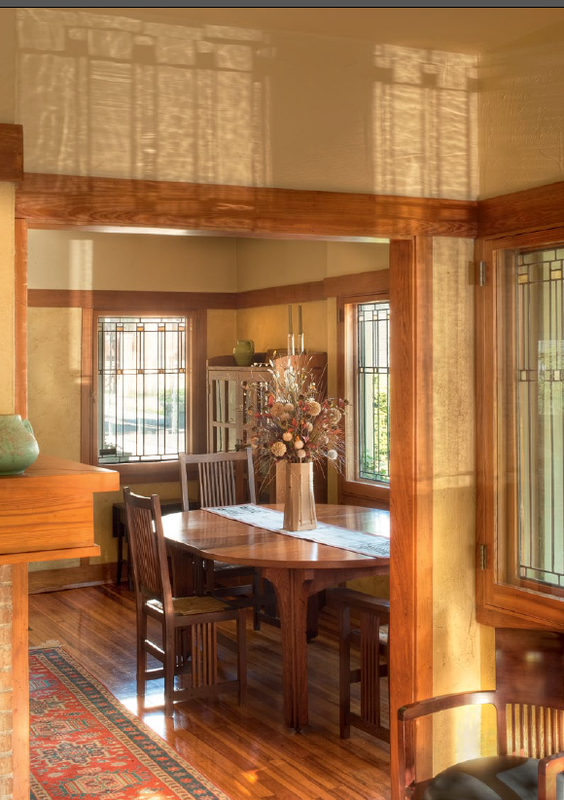 Green referenced the Arts and Crafts movement with wide overhanging eves and intricate timbering on the front porch and on a second-story balcony. 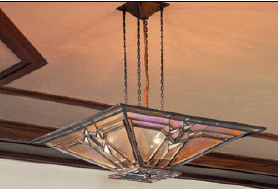 He put leaded glass in a bay window. The intricate patterns worked into the roof brackets and balcony railing recall Swiss vernacular or late Victorian bric-a-brac. Like the Gardener’s Cottage, the Green cottage was built closer to the street than other nearby structures. The two buildings are exactly a block away from one other. In its current condition, the Gardener’s Cottage is largely the work of John Gregory Kinsman, a Buffalo native who has lived and worked as a chiropractor in Massachusetts for decades but who has always visited his hometown frequently. From an early age he had a fascination with Frank Lloyd Wright and the Arts and Crafts movement. In 1987 he asked his mother, Marilyn, to let him know immediately if any of the five houses designed by Wright in Buffalo ever came on the market. Within six weeks, the Gardener’s Cottage was offered for sale, and Kinsman bought it for $107,000. He and his mother agreed that she would live in the house after renovation was completed. The neighbors were alarmed when Kinsman removed the 32 original windows, fearing they were bound for the antiques market. Instead, Kinsman had Buffalo craftspeople Giuliano and Patricia Deganis carefully restore them. He tracked down vintage southern yellow heartwood pine to restore the floors, and cypress for the windows and trim, to match the original woodwork, with Buffalo native John Stith doing the carpentry. In the 1940s, a two-story structure had been added to the east elevation that was stylistically incompatible with the original structure. Kinsman replaced it with a one-story addition more in keeping with the original. He built a new bathroom on the ground floor, renovated the kitchen and restored both of the original fireplaces. On the second floor, two tiny bedrooms along the western exposure had been merged to create a single master bedroom, and Kinsman kept this innovation for functionality and livability. The furniture in the house today consists mostly of items Kinsman either made for it or had collected over the years. The $500,000 sale price, which was paid through a gift to the corporation by Stanford Lipsey, publisher of the Buffalo News, and his wife, Judith, basically covered the cost of the restoration. Kinsman donated the cost of the 32 restored original windows to the corporation as his own gift. Today the entire Barton House and the ground floor of the Gardener’s Cottage form part of the regular public tour of the Martin Complex. The upstairs bedrooms of the cottage are used by the corporation to accommodate guests. 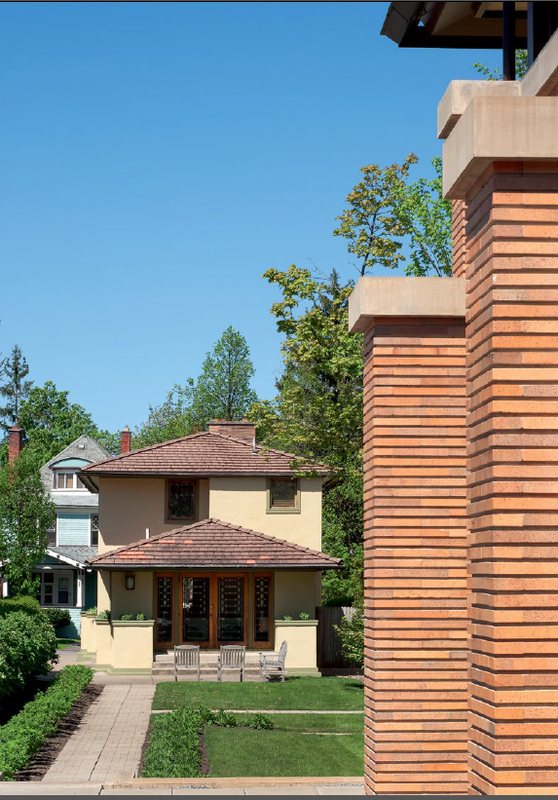 Frank Lloyd Wright understood these two commissions as opportunities to develop a quality design for comparatively modest dwellings. They continue to inspire today as exercises in doing more with less. Douglas J. Forsyth is Associate Professor of History at Bowling Green State University. He is grateful to John C. Courtin, John Gregory Kinsman, Jack Quinan, Mary Roberts, Douglas Steiner and Kitty Turgeon for their generous assistance with this article.